I found an artistic treasure. Goose Creek Rocks! There is a new underground subculture of artistry going on and it's a lot easier to be a part of than you'd think. All you need are some rocks and a little bit of imagination. 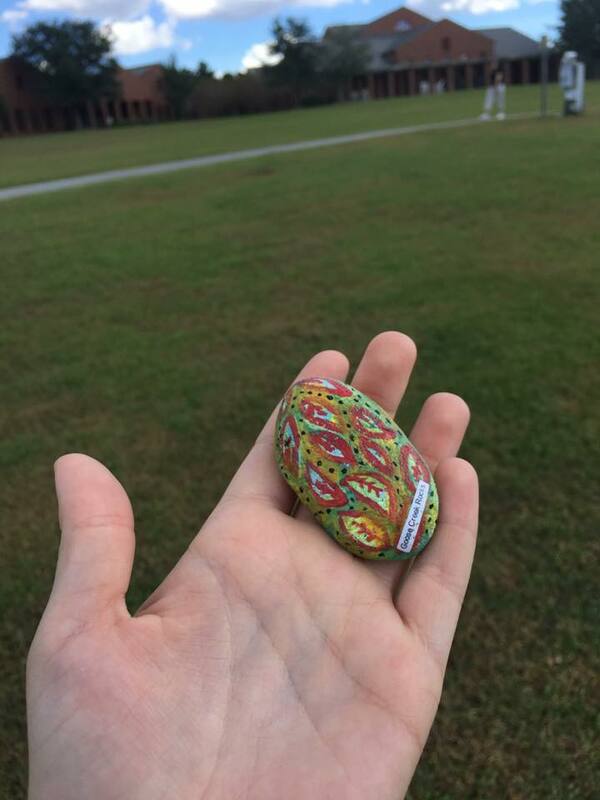 Just decorate the rock and hide it somewhere in public for someone else to find. 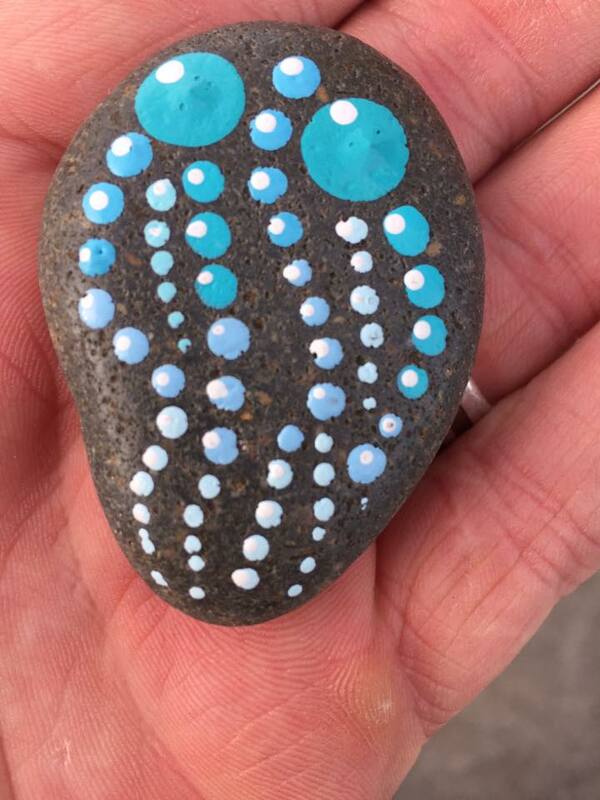 Congratulations, you have now just participated in the impromptu art exhibitions that are sweeping the nation - Hidden Art Rocks of Kindness, so to speak. A local faction of these rock artists has recently cropped up in my home town of Goose Creek. I quickly fell for the idea and went on a rock making flurry of my own. I have been completely inspired not only by all the amazing rock art but by the happy faces of the people who find the hidden rocks. There is also something giddy-inducing about hiding these rocks, like a little fairy, sprinkling magic here and there as you make someone else's day. I must say, it's addictive. Not to mention the exercise you get by walking around to either hide or find rocks. It can turn the biggest couch potato into an explorer of the world, and that's pretty great too. However, I noticed that on the group's facebook page, there were a lot of novice rock painters that wanted to participate but didn't quite know where to start. I saw a lot of the same questions asked over and over, and while me and the rest of the group did our best to answer all those questions, it seemed impossible! 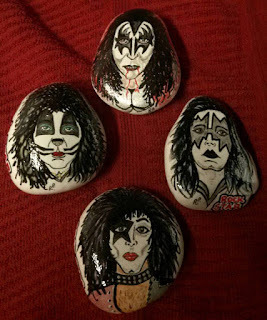 So, I thought, why not just make a huge master list of all the things you could possibly ever want to know about decorating rocks? Might as well represent Goose Creek with pride and do it right. For my fellow local rockers but also for any other faction members that would like a crash course in rock decorating as well. Without further ado, here's the master list. It's huge and I intend on continuing to grow it, so if you have any tips or thoughts to share, please feel free. In the spirit of the rock hunting communities, I want this to be a collaborative effort! Super Master List of Everything You'd Possibly Need to know about Rock Art! - Who came up with this idea? - How did Goose Creek Rocks begin? - Where do I find rocks that have been hidden? - What are the guidelines for hiding and taking rocks? - What should I write on the back of my rock? What kind of rocks should I use? How should I prepare my rocks for decorating? What materials should I use on my rocks? 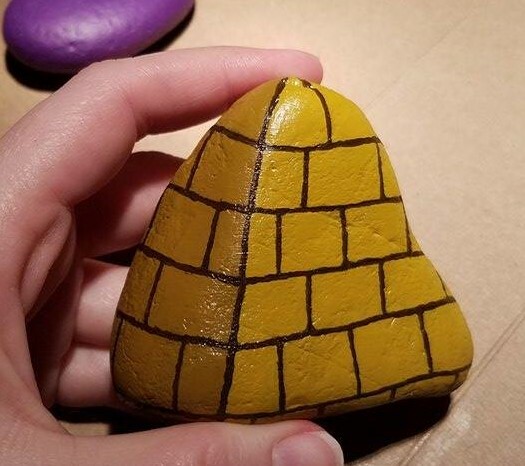 How do I glue three dimensional objects on my rock? How do I seal / protect my rock art? - Why are hairs coming out of my paintbrushes when I paint? - What if the rocks I bought are polished? Is there any way to use them still? - What if the rocks I bought are too rough to paint on? After doing a little bit of research, I eventually traced the rock groups back to a sleepy little town on the Olympic peninsula of Washington named Port Angeles. 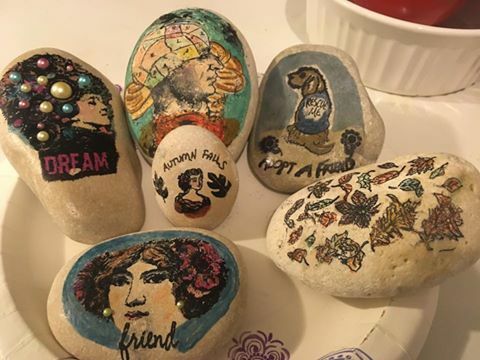 The movement appears to have started about a year ago when a girl named Aisha Lesh and her friends started randomly hiding their own decorated rocks around town. From there, the idea caught fire, and since then their little rock hiding group has swelled to over 5 thousand local members. 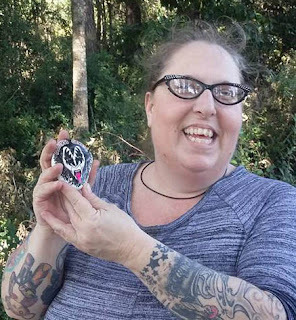 Since the inception of this group, the movement has continued to spread, and there are now literally hundreds of rock hunting groups that have cropped up all over the country. Press about Port Angeles Rocks. Port Angeles Rocks official Facebook page. How did Goose Creek Rocks start? The Goose Creek Rocks page is lovingly tended to by the Morrell family and I have to admit they're kind of like local celebrities down here for starting this group. I think Goose Creek is super thankful to them for bringing this idea back home. The group has recently celebrated it's 2000th member! 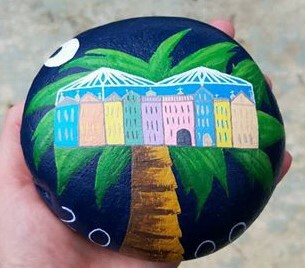 Co-Founder Jerrika Morrell appropriately commemorated the event with a special rock featuring some of South Carolina's best attractions - Rainbow row, luscious palm trees and our new frikken' cool giant bridge. By the way, it's definitely worth checking out Jim Morrell's inspiration for this group, Whidbey Island Rocks' Facebook group, too. They are by far the largest community of rock artists I've come across so far with over 17,000 members, and the work they produce is especially incredible. There is an endless amount of inspiration to beheld there. 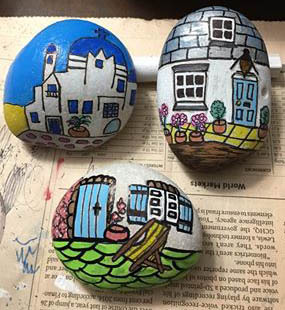 More press about Goose Creek Rocks here. Goose Creek Rocks official Facebook Page. Where do I find hidden rocks? With that being said, some people may genuinely want to find one of these enormously special rocks to keep for themselves, and I don't blame them! So where should you look? The best places to try are near community centers, city halls, local grocery stores, gas stations, hiding in a shopping cart, underneath your door mat, hidden in a pumpkin patch. They can be anywhere, really, so consider it an excuse to be more aware of your surroundings from now on! Are there any rules to hiding and taking rocks? 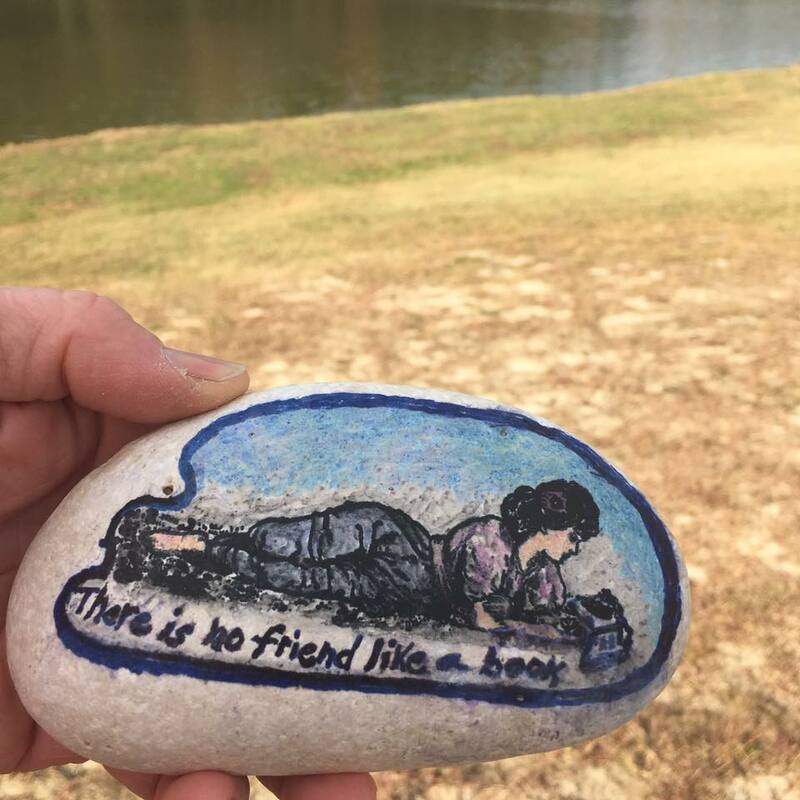 "Please be thoughtful of others and the environment when placing rocks...The city parks department has also asked that you do not hide your works of art in the grass where they may cause damage to mower blades and other equipment. This should also be considered if you are hiding rocks along trails or display garden beds. We want to be a blessing to the community not a nuisance. Also be respectful of private property and businesses. It is always a good idea to ask permission. 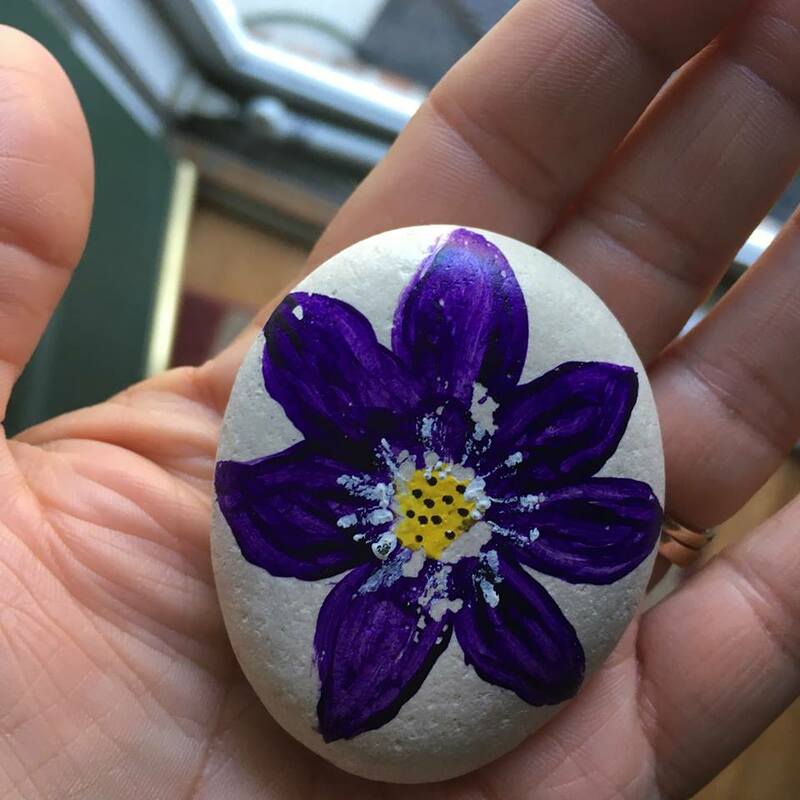 Found Rocks- If you find a rock please share a photo on this page...Sharing only lets the artist know that their art was found and well received. Also, please be respectful of painted rocks on private property or if there is nothing written on the back of the rock it may be part of a more permanent art/beautification display. If you find a rock with a nasty message or one that is in need of some TLC (writing needs to be touched up or resealed),considered repainting it instead of leaving it behind or before hiding it again. Keeping and Re-hiding Rocks- If you find a rock consider giving it a new home in your home or garden. You can start to grow your own Rock Garden. Feel free to re-hide rocks wherever you think they may belong. 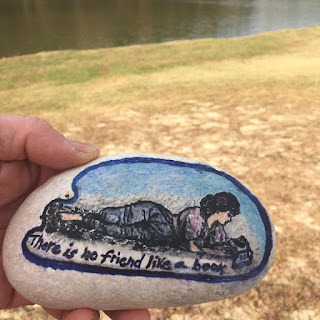 We have had quite a few rocks travel to different states and it is exciting for the artist to see all of the places that they go. That is something to keep in mind when you are traveling. You can bring your own masterpieces or someone else’s along on your journeys and take the fun outside the community and inspire others. How do I write messages on the back of my rocks? Printed out rock label that has been glued on. In the future I intend on making a more detailed label with the whole spiel. 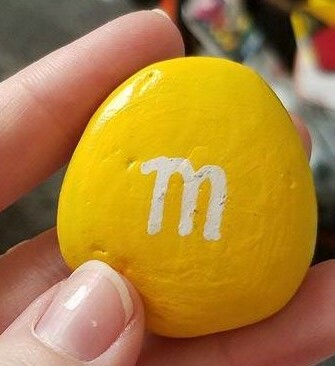 Most people label the back of their rocks with the rock hunting group's name and the text "Keep or rehide." 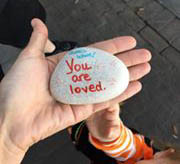 There are a few methods to get this message transferred on your rock. The obvious one would be to simply get a fine point sharpie or something similar and write down your message. My personal technique is to print out a ton of tiny labels on a single piece of printer paper and cut them out. I mod podge the tiny label to the back of my rock before varnishing. You've found a Goose Creek Rock! How do I prepare my Rocks for Artwork? Which rocks should I avoid using? Polished rocks and rocks that have too rough of a surface should be avoided if possible. Read more about why polished rocks won't work here, and possible problems with using rough rocks here. 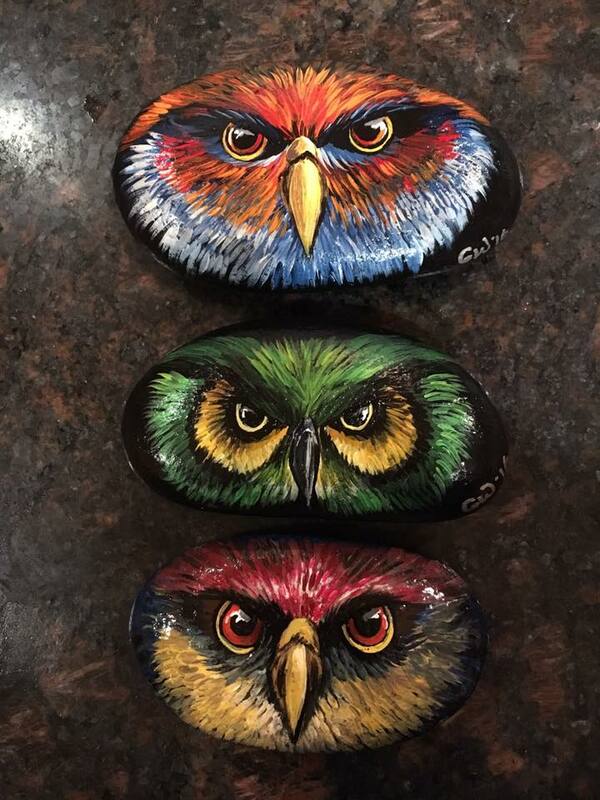 Where do I get the rocks to paint on? Depending on where you live, the best place to try is your local Home Depot, Wal-mart or K-Mart. Lowe's does not carry the right type of rock for the job, weirdly enough. If you're lucky to live somewhere like Whidbey Island, however, you might have better luck just picking up a few rocks the next time you goto the beach or out for a hike. For the rest of us, we'll probably have to order online. I discuss where to find rocks to buy in more detail here. 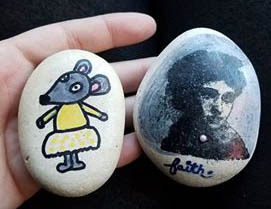 The right rock will take a variety of different media very well, from markers, ink and paint, to unexpected materials like colored pencils, crayon and stamps. This is a great opportunity to get creative with what supplies you already might have on hand. Possibly one of the most important steps of rock art decoration and often one of the most confused. Please stop using regular Mod Podge because it totally doesn't work! Let me steer you in the right direction of sealants- Spray on or Varnish. Why are hairs coming out of my paintbrushes when I paint? Get yourself some better brushes. This happens when you get really cheap quality brushes or use soft brushes on a rough surface (like a rock.) You don't have to spend a lot of money on brushes, you just gotta get the right ones for the job. I discuss which brushes to choose in further detail here. What if the rocks I bought are polished? Is there any way to use them still? if you'd like more ideas on how to still use them for your rock art. What if the rocks I bought are too rough to paint on? This happened to me when I got a hold of some really crumbly egg rocks. If your rocks are really textured and bumpy, they are liable to quickly tear up your art supplies. Remedy this a little bit by building up layers of paint / mod podge on the surface to make it smoother and more accepting of medium. Not only will it save your tools from destruction, it will make the paint and other supplies stay on much easier and evenly. Despite the pain it takes to acquire them, I highly recommend these rocks. If you can get them locally at a store they will run you about $13 a bag, about half the price it costs to order online. Unfortunately, there is only one place that I know of near Goose Creek that sells the Rain Forest River Rocks, which is the Home Depot Summerville. A nice, darker alternative to the white Rain Forest Rocks. These would be great in combination with bright acrylic paint colors or paint pens, which would absolutely "pop" on a dark surface. but most of them are polished. "When a stone is cut and shaped, the final polish is achieved by either using some type of oxide polish or diamond paste, and the surface of the stone is pretty much sealed at this point. The only way you'll get any type of paint to stick to it is to use some very fine sandpaper and scuff the surface so the paint has something to stick to. If it's going to get used or put outside, a clear coat will help protect it, but it won't last forever." You can sometimes find small sacks of decorative rocks at craft stores and dollar stores. This may save you a little bit of headache and money if you just want a small bag of rocks fairly quickly. However, these rocks can be tricky because many of them come pre-polished, which means they won't take paint well. If you do happen to spy some of these at your next visit to the store, make sure they are "natural" and not "polished." buy another set for years. Based off my favorite paint brushes right now, my personal choice would be this pack by US Artist Supply. What you will need to paint your rocks is the workhorse of the painting world- Good Ol' Fashioned Acrylic Paint. It's versatile, dries easily, goes well on most surfaces, can be mixed and used with a variety of media. I'm assuming that you are a beginner/junior artist and won't be needing super high quality paints to make masterpieces to sell to clients. Great! That opens up an excellent option for purchasing acrylic paint, which is the Apple Barrel brand. They are like 50 cents a piece at Wal-Mart. Sometimes they also have a brand called Folk Art which is just as good. However, don't buy them in sets! Here is a set available at 8 bottles for 11 dollars.. twice as much as just buying them individually. Also, don't buy whatever this crap is either. What a rip off! painted with Apple Barrel acrylic paint. So anyways, get the primary colors, which are red, blue and yellow. Then go ahead and get a black and a white, which gets used a lot more than you might think. From there, get all the cool colors you want! I know that there are gloss and matte types of Apple Barrel/Folk Art paints, but I have had my original "matte type" Apple Barrels for so long that I haven't had a chance to try the gloss. I'm sure they're fine, but the originals are always a safe bet. If you want to spring for an even better brand, you can never go wrong with Liquitex. Their paints are rich and juicy, if you're into that kind of thing, but it might be overkill to the average humble rock painter. I like Apple Barrel. 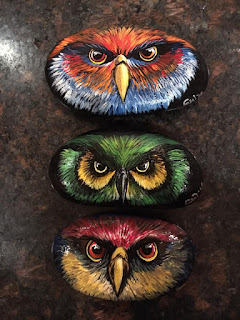 Another way to decorate your rocks would be with markers, especially permanent Sharpie markers. Using markers on the rocks is one of my favorite ways to decorate them, because I have a lot more control over the details and color. 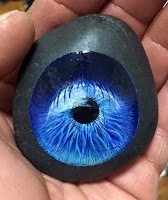 I also don't have to wait for the rocks to dry or mess with paint at all, which is a big plus to me when I want to do a cool rock but I don't want to deal with the extra hassle. 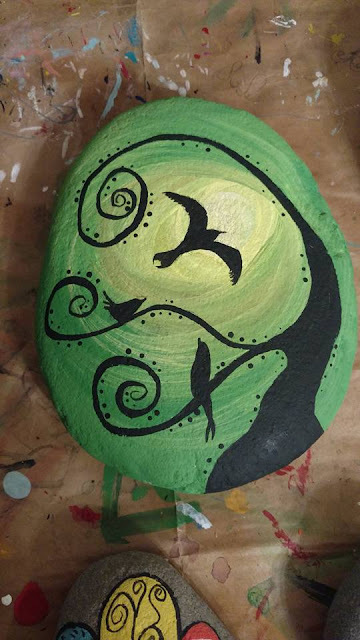 Lena H. asked: "What type of pens are people using to "paint rocks"? --paint pens!?" Well, yes, you can also use paint pens! They're a fun alternative to Sharpies. The ink is very bright pack of these guys at Wal-Mart, they can be a little pricey but will last a long time, I've had some for years. 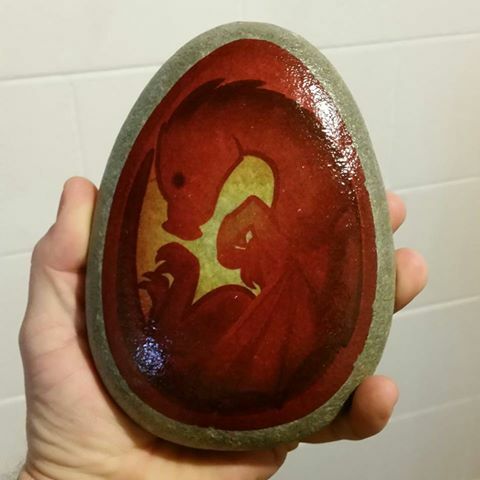 They're great if you want to just paint the rock one nice solid color with acrylic and then draw over that. You can get some really cool effects with them. They are also oil based which means they are resistant to water in their very nature. 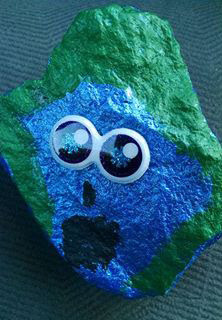 You can even use Crayola or other brands of markers on the rocks, just be aware that the rock will definitely need to be sealed afterwards and the color may smear a bit. I like to use cheapy Crayolas/ect to color large areas of space sometimes instead of using up all of my sharpie ink, because even if that part gets smeary, you don't really notice it that much. You can also experiment with smearing it on the rock on purpose for an "airbrushed shading" look. 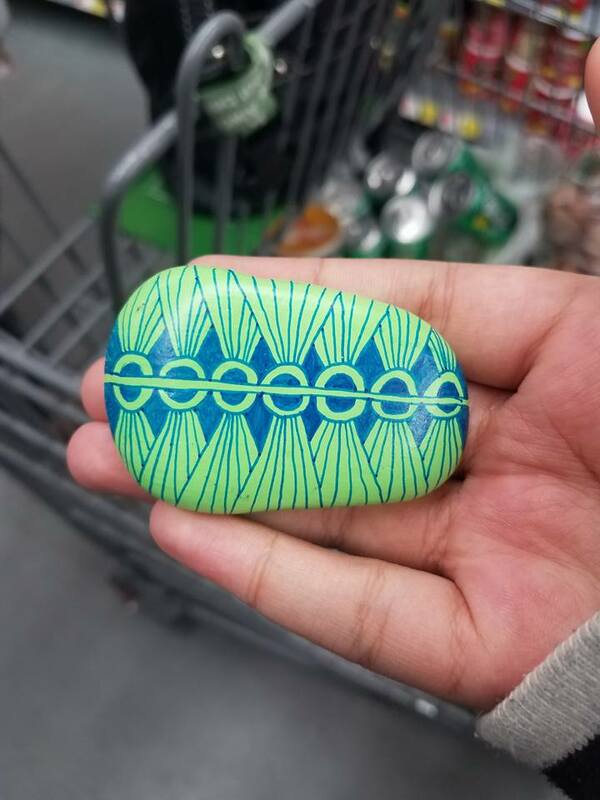 MAKE SURE you only draw on smooth rocks with your Sharpies or other markers, especially if you get ultra fine pointed ones. Drawing on a rough rock surface will very quickly ruin your brand new markers. On the other hand, the smooth rain forest rocks take markers in general very well. Sharpies in particular are fairly waterproof. I dare you to try to wash it off a rock after it's dried. If you want to skip the varnishing step, this is a good way to go. I can't say that they will be completely "weatherproof" but they will last a long time on their own with a good sharpie. 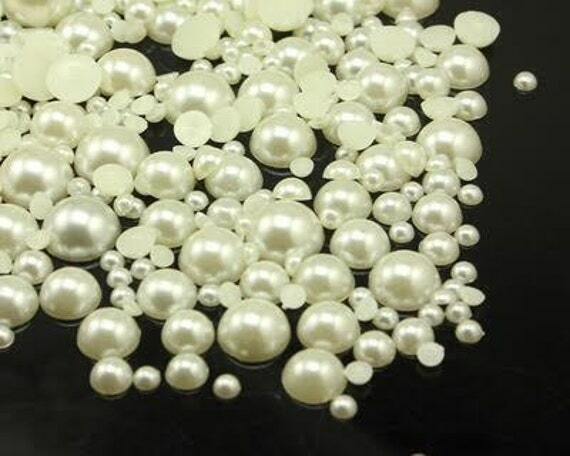 800 flat backed pearls available from Brightenup on Etsy. Search for "Flat Back Beads" on Etsy to see all the interesting options available for this technique. 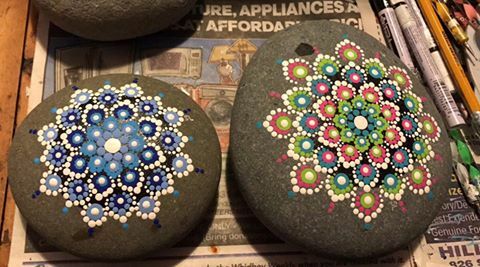 "Use nail dotting tools to make mandalas on your rocks,"suggests Jerrika Morrell. 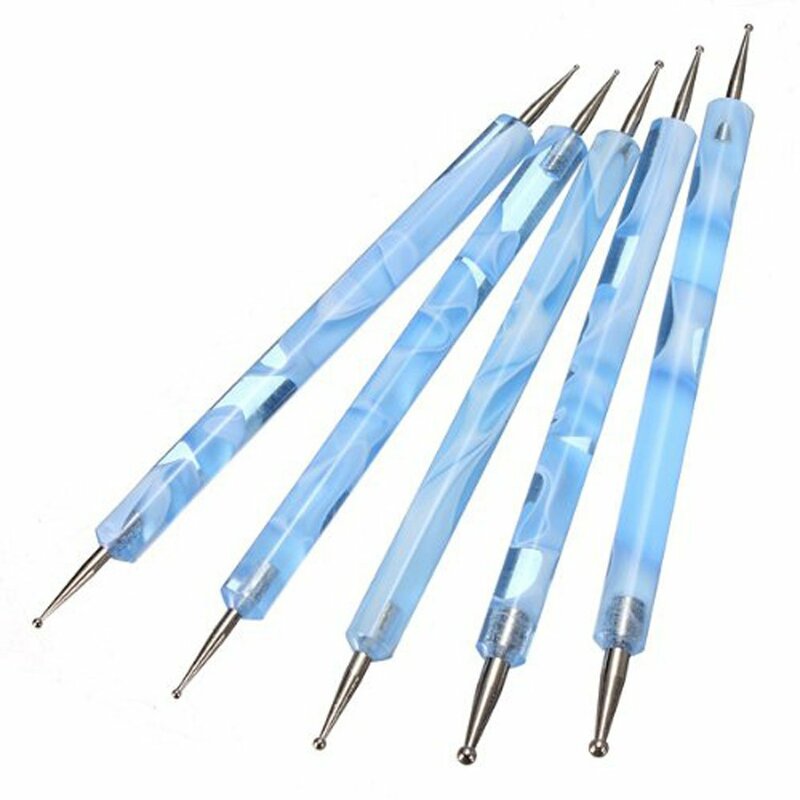 You can purchase this tool on Amazon here. I don't have much experience with putting stamps on rocks myself, but other members have had great success with this technique and I think the finished products turn out pretty impressive. 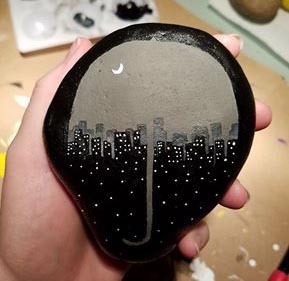 The general consensus here is to properly prepare your rock for the ink by washing it and treating it with a layer of mod podge or gesso, so that the ink sticks on better without smearing. Not feeling very artistically inclined, or have little ones that want to participate that don't have the patience for painting? 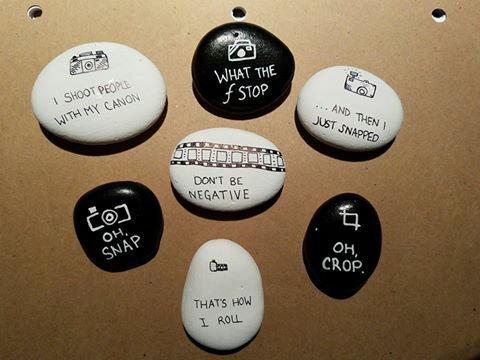 Perfect reason to use stickers on your rocks! Just peel, stick and seal. 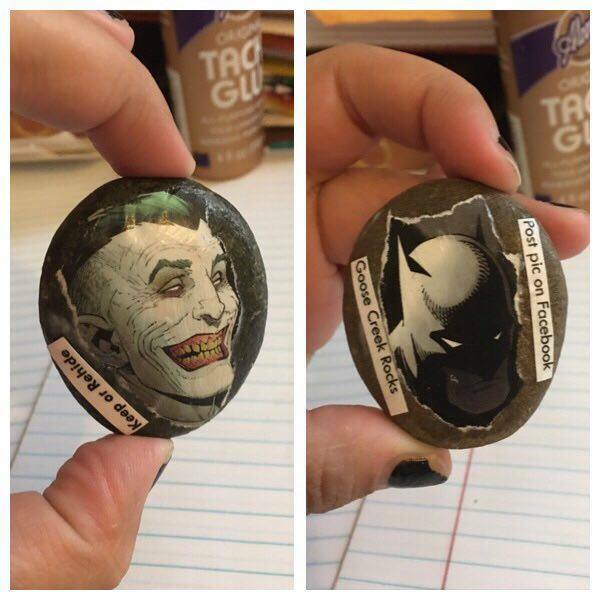 You can even make your own stickers out of cut outs from comic books, magazines, or any other printed image you find interesting. 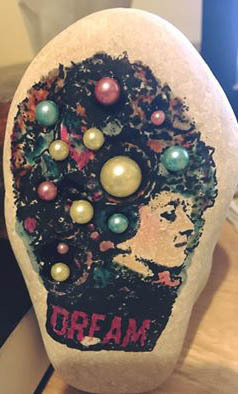 Simply mod podge or glue the cut outs onto the rock and seal like normal. I think this is a really simple but cool effect. If you are looking to attach something to your rock, you'll need a good glue to use. For flat paper cut outs I recommend using mod podge. Bonnie Burn says super glue works good for the flat backed bead techniques. Another great strong holding glue to consider would be E6000, which is less corrosive and comes highly recommended for a variety of craft projects involving glued on components. 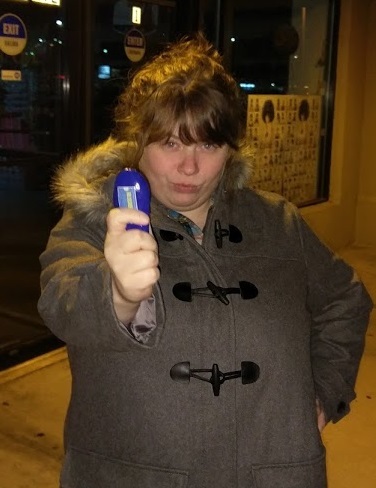 Tina Ballentine, Pokemon rock painter extraordinaire, likes to use spray on sealer. 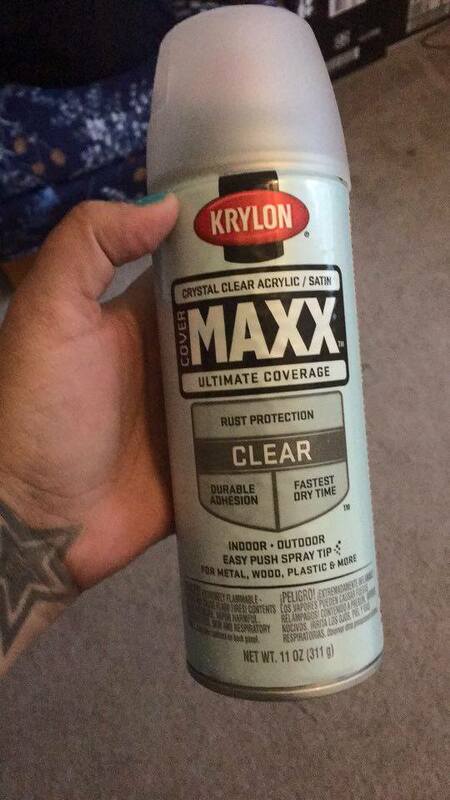 "I use the Matte Clear Sealer by Krylon. Spray on two coats and let it dry over night." I think this would be a great beginner method or a way to get a lot of rocks sealed at one time. If you want more tips on how to to use a spray on medium, check out this great little tutorial I found. I personally use a paint on varnish by Ceramcoat and I really like it. It's not quite "weatherproof" but it's pretty much the closest you can get without all the toxic funky chemicals. Make sure you paint on thin layers and do a test corner first to see how it reacts with your specific materials. I typically do this step with one of those black sponge brushes because I can just smear over a nice even layer fairly quickly and it doesn't show as many brush strokes. Do the front, let it dry, then do the back. If you do this with a paint brush, make sure the paint brush does not have any left over paint bits in it, as these will come off the brush and get sealed into your beautiful artwork... bummer. Also, there is this sealant by Americana available for around 3 dollars.. I have not tried it, but it might be worth experimenting with. If you do decide to try it, let me know in a comment below. 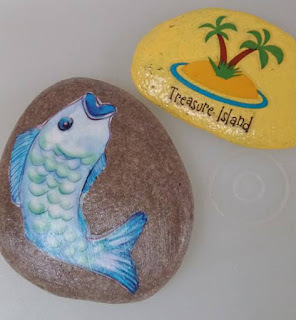 Whichever technique you decide to use, do a few "practice" rocks first to ensure you don't have any trouble when the time comes to put the sealant on your nicely decorated rocks. This step can take a little finesse to get right. If you already used Mod Podge on a bunch of your rocks, don't worry. While they won't be permanent per say, they can still hold up after many hiding rounds. I've noticed a lot of the rocks that were probably sealed with mod podge have now developed an interesting decay to them that in itself is kind of natural and beautiful. 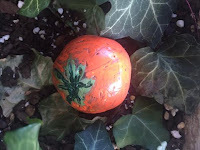 Maybe from now on you seal your rock art with mod podge armed with the knowledge that its current state is not necessarily permanent, but that it is an ever changing organic entity. Or maybe that's just me being overly artsy fartsy again! In any case, it's supposed to be in all good fun though, so don't fret too much. There are no right or wrong answers. Here are some great examples of various techniques discussed in this FAQ. I also threw in some candid photographs of "rock hunters" finding treasures of their own! "Who ever came up with this idea is a genius. Me and my kids dont watch that much tv anymore. We aren't sitting in separate rooms. We are at the kitchen table together laughing painting rocks and out walking alot hiding rocks. Thank you." 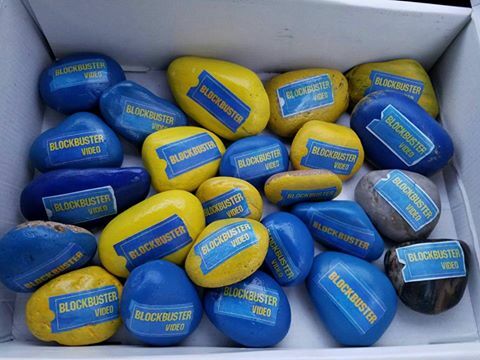 - Bonnie M.
Jerrika and Victoria Morrell made these rocks to commemorate their pleasant time working for Blockbuster. They put them all around town at places where they used to do business with their clients. Of course, they put some where the old Blockbuster used to be, too. That's where I found mine! When I touched based with Jerrika to help me write this FAQ, she admitted that hasn't hidden this rock yet. If you ask me, I think she should keep it for herself! As rock artists we'll inevitably get an attachment to certain rocks that we make, and maybe we shouldn't altogether ignore that sentiment. Sometimes the best gifts we can give are the ones we give to ourselves. I love the sprawling philosophy discussions that you can get into when thinking about the seemingly simple idea of hiding painted rocks. "I was having a rough and emotional day , so we headed out for a walk and I found these beautiful work of arts. We had no intention of even looking but as I walked these 2 jumped out at me. Thank you for bringing a smile and laugh to my gloomy day." - Tammy F.
Someone found my abstract leaf rock that I left near a local walking path! Strawberries are a cute and easy idea for a design. My mom thrilled after finding the Gene Simmons Rock! Special thanks to Jim and Jerrika Morrell, Bonnie Burn, Tina Ballentine and the members of Goose Creek Rocks for all their valuable information and feedback! I hope this helps. Absolutely WONDERFUL article!! I appreciate all the work you out into it!! You did an excellent job on this article.